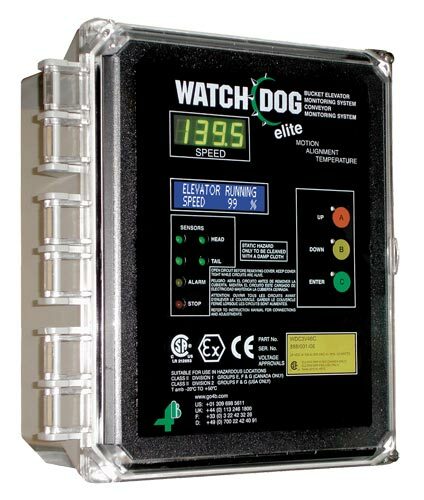 The Watchdog™ Elite is a microprocessor controlled unit with combined belt speed, belt alignment, bearing temperature, pulley alignment and plugged condition monitoring for bucket elevators and conveyors. An LCD screen displays machine status messages (available in four different languages) and a super-bright LED display shows belt speed. Calibration and set-up parameters are accessed via a password and front panel touch buttons. This version of the F500 Elite Fieldbus gateway has been designed to work as a Watchdog Elite communications gateway and allows up to 10 Watchdog control units to be networked together through RS-485 communication BUS. 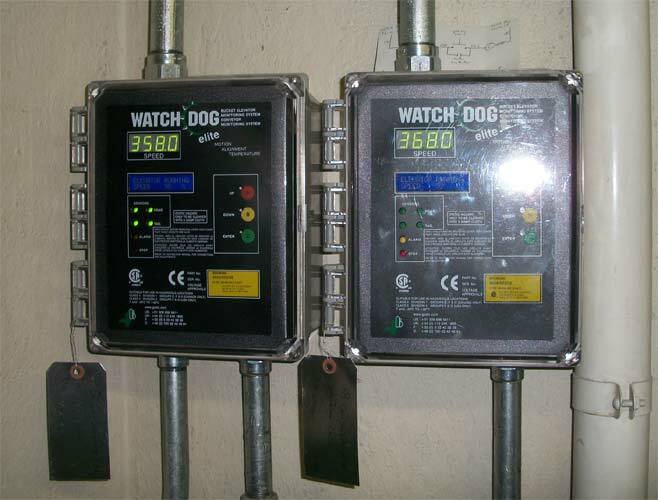 The Watchdog data is then converted to a Fieldbus protocol. 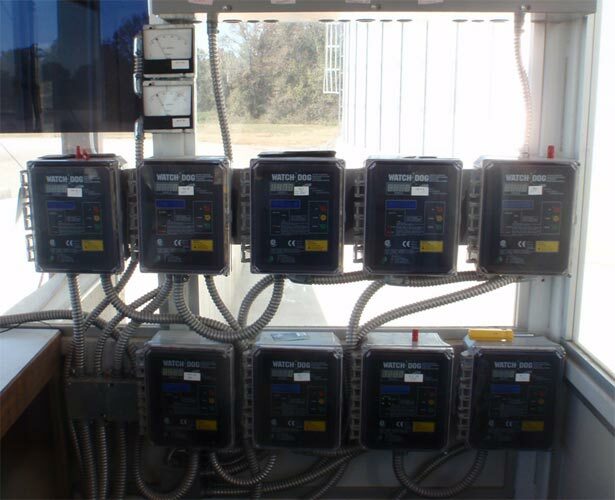 Supported protocols include: Ethernet/IP, Modbus TCP, Modbus RTU, DeviceNet, Profibus and others on request. The optional Watchdog™ PLC interface board provides additional alarm relay contacts for under speed, misalignment, and bearing temperature. The Touchswitch is an electro-mechanical limit switch with no moving parts, which detects tracking and misalignment problems on bucket elevators and conveyors. When a belt misaligns or a pulley moves over and contacts the sensor, the built in solid-state electronic circuitry detects the lateral force of the belt or pulley and activates a voltage free relay contact. This relay contact is used to immediately alarm and shutdown the machine. Non-contacting extended range magnetic proximity sensor, not affected by dust or material build up, used to detect moving ferrous material up to 100mm away from the sensor. The WDA sensor can be used on bucket elevators to measure speed and alignment by sensing either the metal elevator buckets, or the ferrous bolts attached to plastic buckets. A more specialized use for the WDA switch is as a broken/slack chain detector on drag chain conveyors, or as a non-contact speed switch for screw conveyors. The ADB series have been designed to allow the depth of the sensor to be adjustable depending on your application. A number of versions are available with probe lengths of 50, 100, 200 and 300 mm. The sensors screw directly into a bearing housing through a 1/4” BSPT threaded grease zerk. Each sensor is fitted with a grease zerk to allow lubrication of the bearing without the need for removal of the sensor. The ADB series have NTC or PT100 type thermistors which allow for continuous temperature monitoring. The WDB series bearing sensors are designed to screw directly into a bearing housing. Each sensor is fitted with a grease zerk to allow lubrication of the bearing without the need for removal of the sensor. The WDB8 series have a 1/4” BSPT thread. The WDB2 series have a 1/8” NPT thread. Three versions are available; an NTC thermistor or Pt100 RTD type for continuous temperature monitoring, and a PTC thermistor model with the following trip points (specify when ordering):60°C, 70°C, 80°C, 90°C for step (Cold/Hot) temperature monitoring. The WDB7 series is a lug style NTC thermistor or platinum RTD (PT100) type for continuous temperature monitoring. It is designed to bolt directly onto a bearing housing, motor, gearbox, or machine casing. The mounting hole is M8 which can be drilled out up to M10 diameter. The sensor can be connected to a PLC or to a hazard monitoring system, such as 4B’s T500 Hotbus Elite, Watchdog Super Elite, or T400 Elite. The connections are not polarity sensitive therefore special connections requirements are eliminated. The MDB series is a range of bearing sensors manufactured to screw directly into a bearing housing through the existing 1/4” BSPT threaded grease zerk (can be installed in 1/8” NPT grease zerk fitting with an adapter). Each sensor is fitted with a grease zerk to allow lubrication of the bearing without the need for removal of the sensor. Detects the presence or absence of materials. Is used for monitoring the speed of machinery via a speed module or PLC.